Since high school and college, and through grad school and beyond, I have been interested in the interface between psychology, psychiatry, and brain science. After spending some time in industry, I returned to academia, and have been at the University of Connecticut for 30 years, where my lab is mainly focused on animal models of motivational function and dysfunction. In particular, I have been studying the role of brain dopamine systems in behavioral activation and effort-related aspects of motivation. Based upon my own research, and my reading of the literature, I have become intrigued by the idea that motivation is not just about emotion or desire, but also is intimately connected with the processes through which the brain instigates, sustains, and organizes action. A motivated graduate student does not simply desire a Ph.D.; he or she works very hard for it! Brain mechanisms regulate the decision making processes involved in effort expenditure and the allocation of behavioral resources across multiple goals. For several years, my lab conducted basic behavioral neuroscience research on the role of ventral striatal dopamine and related neural systems in regulating work output and the behavioral economics effort-based choice. More recently, I came to realize that our research also had considerable clinical relevance. Symptoms such as psychomotor retardation, anergia, amotivation, and fatigue are seen in various disorders, from depression to schizophrenia to Parkinson’s disease. These symptoms appear to be related to peripheral inflammation as well as brain chemistry. Thus, our recent focus has been on establishing formal animal models of activation and effort-related motivational dysfunctions that are relevant for understanding psychopathology. We also study drug development, using various models to induce a low-effort motivational bias, and then determining if well known or novel drugs can partially or fully restore the normal pattern of behavior. Much of this work is summarized in recent reviews in Current Opinion in Behavioural Sciences and Frontiers in Behavioral Neuroscience. References: Salamone JD, Correa M. (2018) Neurobiology and pharmacology of activational and effort-related aspects of motivation: rodent studies. Curr Opin Behav Sci 22:114–120. Neuroscience is poetry, an endless endeavor into one’s self. Growing up female in a lower middle-class family in a town of two thousand people, my options appeared limited, but the future I envisioned for myself would not be bound by what my circumstances indicated. A future in neuroscience looked lightyears away, especially considering I had absolutely no concept of what neuroscience was. People from my small town typically stayed there, got married, and had kids. There is nothing wrong with that path but I knew it was never going to be mine. Luckily, I was one of those weird kids who loved school and was curious about everything, so I knew university would be my way out. Although university seemed inevitable, I would be the first in my family to attend. Perhaps because I loved math, or because I grew up without much money, I chose to major in finance. I subjected myself to three years of business classes before I knew that it wasn’t for me. It was around the time of the financial collapse when jobs became scarce that my dreams of becoming an investment banker began to evaporate, along with the economy. This realization allowed me to re-evaluate my life. The curse of curiosity is that in making everything interesting, it becomes difficult to select just one future. I had taken a Psychology class in high school but it wasn’t until my third year of university, at that pivotal moment, that I took an introductory Psychology course and found my future. I loved all my Psychology classes but neuroscience was by far the most interesting. What is more fascinating than the brain understanding itself? Entering graduate school was a whole new adventure. I moved across the country with all of my belongings, including a healthy(ish) dose of imposter syndrome that, I’ve learned, never completely goes away. There’s an infinite amount of knowledge and staring into that vastness can be daunting. In grad school, you are quickly disabused of the notion that you can completely know and understand anything, let alone all facets of neuroscience. My entry point into the field was stress(ful). It’s an easy concept for any student to grasp, as we all have a deep and personal relationship with stress. The more I learned about how the stress response works, the more intrigued I became. The idea that something psychological could have a physical manifestation in our brain and body, possibly leading to physical and mental illness, was fascinating. My undergrad honours project investigated how acute stress influences cognitive flexibility and I continued that theme into grad school. Currently, I am focused on how excessive signalling of the stress neuropeptide, corticotropin-releasing factor (CRF), may lead to alterations in a constellation of higher-level cognitive functions, including cognitive flexibility, decision-making, and affective bias. These cognitive effects may be driven, in part, by interactions with the dopaminergic system and so ongoing in vivo electrophysiological experiments aim to illuminate how excessive CRF signalling within the brain influences dopamine neuron activity. As I rapidly approach the end of my grad school experience, with only one (hopefully) year left of my PhD, my future is once again uncertain but I trust that whatever led me here will lead me to another future just as fulfilling. In this study, Carvan et al. (2017) examined the effects of developmental methylmercury exposure on directly exposed adult zebrafish as well as subsequent generations. Researchers exposed zebrafish eggs (F0) to varying concentrations of methylmercury for the first 24 hours post fertilization (24hpf). Hyperactivity and visual deficits were observed not only in the directly exposed (F0) generation, but in the subsequent F2 generation. The reported deficits were also stronger in the F2 generation compared to the F0 (direct exposure). Although other researchers have conducted similar studies on the effects of developmental methylmercury exposure, this was the first reported study to investigate and suggest possible epigenetic underpinnings for the reported transgenerational deficits. Through analysis of F0 and F2 sperm, Carvan et al. (2017) reported a downregulation of DNA methyltransferase (the enzyme involved in attaching methyl groups to DNA, leading to methylation), which was intuitively associated with global DNA hypomethylation. DNA methylation commonly leads to inhibition of transcription, which may have played a role in the observed neurobehavioural deficits. There was also dysregulation of genes involved in cell proliferation, which plays a large role in cell death and differentiation. In recent years, the zebrafish has become an important species in a number of genetic, pharmacological and developmental studies due to their simple husbandry, non-invasive drug administration techniques and highly prolific nature. In terms of human relevance, this study suggests the consumption of methylmercury laden foods by pregnant mothers not only affects her and the unborn child, but may have the potential to influence subsequent generations (i.e. grandchildren). It is the hope that future studies will continue to investigate these transgenerational effects in different species, leading to better control of health and environmental impacts of heavy metal pollution. Scientists are problem solvers. Each day, we enter the lab focused on a grandiose research problem. And then, we spend our time embroiled in solving all the small issues preventing us from adequately answering that question: why is my signal so dim or noisy? why does my model not fit? why does this animal not behave in the way it should? If you are like me, you need a win occasionally. That is why I began rock climbing in the 3rd year of my PhD at the University of British Columbia. 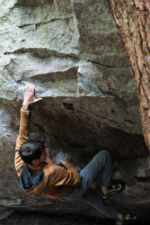 In rock climbing, whether you are inside or outside, climbing with a rope or bouldering without, your problem-solving skills are constantly put to the test. The goal of climbing is simple: get to the top of the route or boulder problem using a circumscribed set of hand and foot holds. How exactly you solve that problem is completely up to you. In my preferred discipline of bouldering, you are typically staring down a piece of rock anywhere from 8-20 feet in height. Inspecting the boulder for small impurities - a small divot with space for a few fingers on your right hand, a swath of rock with just enough friction to allow your left hand to hang on, a chip to place your left toe on – you can begin to get a picture of what sequence of body positions will allow you to ascend it. The next step is practicing these individual moves until each of them feel comfortable, tweaking sequences or limb placements along the way. With any luck, you’ll be standing victorious on top of the boulder in no time (usually after a few hours of painful, skin-peeling failures). But, as in science, sometimes a simple-sounding problem isn’t so easily solved. Perhaps you keep falling because you can’t quite pinch that chip of rock hard enough, or maybe you lack the requisite flexibility to lift your heel up towards your shoulder to rest on the lip of the boulder. For many people, this is where the rock climbing gym comes in, providing access to dozens of boulders assembled out of plastic holds to hone your skills. If you are as inflexible as me, you may also invest your time in one of the yoga classes that are typically offered. For me, this process of identifying a climb to complete, building up the requisite skills and strength to do it, and then testing your progress on the climb provided a welcome respite from the incremental pace of research. It didn’t hurt that I was lucky enough to complete my PhD in beautiful British Columbia, Canada, home to one of the best outdoor climbing destinations in the world, Squamish. Thanks to the latitude, we could spend summer days in lab carefully testing our research question before driving up the immaculate Sea to Sky highway to climb until the sun went down late in the evening. For me, the highlight of these excursions was convincing one of the visiting speakers from our Neuroscience seminar series to extend her stay in Vancouver to spend time in Squamish, after discovering that she was an avid climber. Definitely the most fun and exhilarating networking experience I’ve had! So, if you are looking for an escape from the lab where you can get fit, meet cool people, and challenge yourself, look no further than climbing. Even if you are afraid of heights or imagine you lack the requisite upper body strength (both common excuses that I myself made before being convinced to try it), I recommend going to your local climbing gym and taking an introductory class. Chances are, even on that first day, you’ll identify and solve a problem that could hook you in the same way I was a handful of years ago. The medial prefrontal cortex (PFC) has long been recognized as a key orchestrator of higher-order cognitive and emotional processes, with the prelimbic (PL) and infralimbic (IL) subregions having complementary functions in some behavioral assays, but opposing functions in others. For instance, both PL and IL support shifting strategies in attentional set-shifting tasks1, but appear to differentially regulate conditioned fear2. Importantly, the two regions are known to be heavily interconnected, but the issue of how this reciprocal connectivity impacts behavior has only recently been addressed. In a recent Nature Communications paper, Mukherjee & Caroni use novel viral and chemogenetic techniques to first show dissociable roles for PL and IL in attentional set-shifting and trace fear conditioning tasks, and then go on to show unique roles for PL-to-IL versus IL-to-PL projections in these tasks. In the set-shifting task, Mukherjee & Caroni found roles for the PFC subregions consistent with the idea that the PL is involved in building upon past experience to learn new strategies, while the IL may promote selection of alternative choices within a task. Intriguingly, while inhibition of PL-to-IL connectivity had no impact on any aspect of the set-shifting task, silencing of the IL-to-PL projection reproduced effects induced by global silencing of the IL, highlighting that IL output to PL is a key feature of IL-dependent processes. Similarly, silencing of IL-to-PL connectivity blocked IL-dependent extinction of trace fear conditioning. The authors then showed that interactions between the PL and IL 12 hours after learning of initial associations in the fear conditioning task affect future extinction, with silencing of either PL-IL or IL-PL connectivity at this time-point perturbing extinction later on. Collectively, their data suggest that the PL is important in the formation of initial associations, while IL can play a key role in learning new alternatives in the future. Further, these findings identify novel PL-IL interactions occurring within a critical period slightly after initial learning that are key to establishing how the IL will influence later learning and behavior. References: 1Oualian C & Gisquet-Verrier P. 2010. The differential involvement of the prelimbic and infralimbic cortices in response conflict affects behavioral flexibility in rats trained in a new automated strategy-switching task. Learning & Memory, 17(12), 654-668. 2Sierra-Mercado D, Padilla-Coreano N, Quirk GJ. 2011. Dissociable roles of prelimbic and infralimbic cortices, ventral hippocampus, and basolateral amygdala in the expression and extinction of conditioned fear. Neuropsychopharmacology, 36(2), 529. 3Mukherjee A & Caroni P. 2018. Infralimbic cortex is required for learning alternatives to prelimbic promoted associations through reciprocal connectivity. Nature Communications, 9(1), 2727. The IBNS Program Committee is now accepting symposium and satellite proposals. 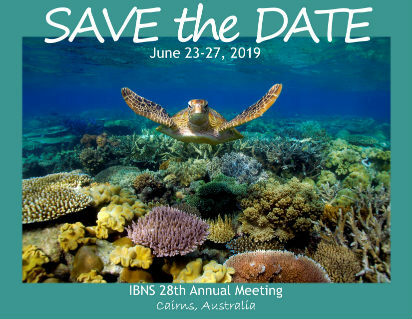 Members and non-members of IBNS are invited to submit proposals. Download and share these cool flyers with your colleagues and friends! IBNS is pleased to introduce you to the Local Organizing Committee for IBNS 2019. Next year’s annual meeting will be held in Cairns (locally pronounced as “cans”), Australia. Although Sydney is the most common entry point to Australia, it is located approximately 2400 km (1500 miles) south of Cairns. When planning for this conference, it’s good to consider the size of Australia (approximately equal to the continental USA or slightly smaller than Canada). Although most attendees are likely to fly to Sydney and then make their way to Cairns, it’s important to know that Cairns has an international airport with direct flights to all major Australian cities as well as direct flights to Hong Kong, Tokyo, Osaka, Singapore, Manila, Bali, and Auckland. Bernard Balleine is an Australian Laureate Fellow, a National Health and Medical Research Council of Australia Senior Principal Research Fellow and Scientia Professor and Head of the Decision Neuroscience Lab at UNSW Sydney. He received his BA (hons) from Sydney University in 1988 and his PhD from Cambridge University in 1992, after which he was elected a Research Fellow of Jesus College before appointment as an Assistant Professor at UCLA in 1996. He became a full Professor at UCLA in 2004. He moved back to Australia in 2010, first to Sydney University and then UNSW. His research aims to understand the neural bases of the learning and motivational processes that control volitional, or goal-directed, action in healthy humans, groups with various psychiatric conditions, as well as in animal models of those conditions and of addiction. This issue has direct bearing on our understanding of the role that the integration of cognitive and emotional systems in the brain plays in executive functions, evaluative processes and decision-making. Dr. Michael Bowen is a Senior Lecturer, NHMRC Doherty Biomedical Fellow and Associate Director of the Lambert Initiative at the Brain and Mind Centre, University of Sydney. His lab applies cutting-edge cellular, computational and pre-clinical research techniques to central nervous system drug discovery and drug development. His group has a particular focus on developing novel therapeutics for substance use disorders and social disorders. Dr. Bowen has received numerous awards and honours including the 2016 Eureka Prize for Outstanding Early Career Researcher, the 2016 IBNS Early Career Award, and the 2015 NSW Premier's Prize for Early Career Researcher of the Year. Tim received his PhD from McGill University in 2004 and completed postdoctoral training at UCLA. In 2009, he established the Cognitive Neuroepigenetics laboratory at the Queensland Brain Institute. He has received a number of awards for his work, including a UQ Research Excellence Award, the A.E. Bennett Interanational Research Award from the Society for Biological Psychiatry, a Science Without Borders visiting professorship for the government of Brazil and, in 2018, was awarded an NHMRC Senior Research Fellowship. Dr. Bredy's work spans multiple aspects of neuroepigenetics and memory, with significant discoveries implicating a role for a variety of molecular mechanisms including histone modification, DNA modification, small and long non-coding RNA and more recently RNA modification in experience-dependent plasticity in the adult brain. Professor Deborah Hodgson is Pro Vice-Chancellor for Research and Innovation, and Director of the Laboratory of Neuroimmunology at The University of Newcastle (UON). As Pro Vice-Chancellor, Professor Hodgson provides leadership in driving the University’s research and innovation agenda with a particular focus on engagement with industry, business and our stakeholder community. As Pro Vice-Chancellor, Professor Hodgson has been instrumental in improving research opportunities at the University of Newcastle and in particular is committed to supporting the development of emerging research leaders and ensuring that provision is made to support early career researchers. Professor Hodgson continues to be an active researcher, with funding from national and international funding bodies. She has an active laboratory dedicated to understanding the dynamic interactions between the brain and the immune system. A primary focus of which has been the role of early life events in the programming of, and in determining resistance to, pathology. 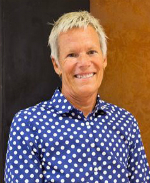 In addition to her academic and research roles she is a graduate of the Australian Institute for Company Directors and sits on a number of national Boards. Finally, she is the Academic champion for SAGE (Science Australia gender equity), at UON. Professor Stephen Kent completed his PhD at the University of Illinois, and then spent the following six years as a post-doctoral fellow, primarily at INSERM in Bordeaux, France. He has been at La Trobe University since 1996 and since 2011, has been Head of the School of Psychology & Public Health. He is a Fellow of the International Behavioral Neuroscience Society, a past-President, and a recipient of the IBNS Career Achievement Award. He is also the current Chair of the Heads of Departments and Schools of Psychology Association (HODSPA) in Australia. Current work in his laboratory is investigating how calorie restriction reduces neuroinflammation, which may lead to novel treatments for this process that is involved in neurodegenerative diseases and stroke. Professor Simon Killcross completed his PhD in Experimental Psychology from the University of Cambridge in 1993. After a period as a Research Fellow at Magdalene College, he moved to a lectureship at the University of York in 1996, and then to a Senior Lectureship at Cardiff University in 1999. Moving from the role as Deputy Head of School at Cardiff University in 2009, he became Head of School of the School of Psychology at UNSW in 2009, and also Deputy Dean for the Faculty of Science in 2017. His current work examines the role of frontal cortical regions in response competition and attention, the role of dopaminergic systems in learning, and the interaction of frontal, striatal and limbic systems in motivation and emotion. Karly received her PhD from the Queensland Brain Institute at The University of Queensland in 2016. She was awarded a CJ Martin Early Career Fellowship from the NHMRC to begin working under the supervision of Professsor Trevor Robbins at the University of Cambridge (UK) in 2017. In 2019, she is returning to Australia to work at the University of New South Wales with Professor Bernard Balleine. Dr. Turner’s research aims to understand where and how the brain makes the transition from goal-directed actions to habits. This research aims to contribute to fundamental learning theory and translational mental health research, with a particular focus on disorders such as obsessive-compulsive disorder (OCD) and drug addiction. Zoltan is Professor and Head of the Laboratory of Psychiatric Neuroscience at James Cook University, Townsville, Australia. He was previously University Lecturer in the Department of Pharmacology, University of Cambridge and a Fellow of Pembroke College, Cambridge where he served as Director of Studies for Medicine. He trained at the Department of Psychiatry at Harvard Medical School and at The Rockefeller University. He currently conducts research on major psychiatric disorders, such as depression and schizophrenia and studies the contribution of systemic factor such as stress, metabolic changes, gut microbiota and immune activation to brain health. He was awarded the Curt P. Richter Prize of the International Society of Psychoneuroendocrinology, the DuPont-Warren Award by the Department of Psychiatry, Harvard Medical School; and a NARSAD Young Investigator Award. He served on the Awards Committee of IBNS and he is currently member of the Executive Committee of the International Society for Nutritional Psychiatry Research and he is the Secretary of Biological Psychiatry Australia and on the editorial board of the journals Stress and Nutritional Neuroscience. Do you have an interesting hobby or member news to share?